For many years, the benefits of spinning have been known to the thousands of men and women who take spinning classes each week. Spinning, for those who may not know, is a workout completed on a stationary bike. Here are some of the benefits of spinning as opposed to other popular cardio workouts. Many who want a great cardio workout are unable to get one by running or power walking due to problems with their knees or feet. One of the benefits of spinning is that you can get a killer cardio workout without putting any pressure on your knees, hips or feet. For some this may be the only effective cardio workout that they can do. It is also a great choice when recovering from an injury. It allows you to keep working out while giving your knees or feet time to heal. Of course, you should ask your doctor before spinning after an injury just to be safe. Another one of the great benefits of spinning is that you can be in a class with others who are at different fitness levels and each of you will get the best workout for you. That is because you work at a pace that is best for you while the others in the class do the same. This is great news for someone who wants to be able to work out with a partner or friend who is much more fit that they are. This allows all fitness levels to be in one class while all getting a great workout. There is something about being in a class that pushes you do to your best. Another of the benefits of spinning is that you can get a boost from the others in the class. You can encourage each other to push the limit just a little further. It’s a lot easier to push yourself when surrounded by other people who are doing the same. One reason that spinning is so popular is because of the number of calories that you can burn during a workout. You can burn up to 500 calories in a 30 minute session. It is difficult to burn that many calories in such a short period of time with other workout methods. 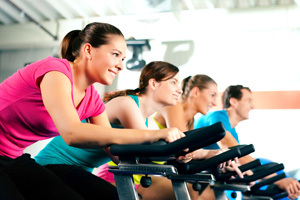 Many spinning classes are longer than 30 minutes meaning that you can burn even more calories. Of course, the number of calories that you burn will be dependent on how much effort you put into the workout, but the potential for burning a huge number of calories is there. One of the most important benefits of spinning and other cardio workouts is the benefit to your heart. While some spinning classes are designed to build muscle, some also add portions to the session that are designed to strengthen your heart. The benefits of spinning are many. As mentioned above, for some it is the best kind of workout as it will save further wear and damage to their knees and other joints. Another of the benefits of spinning is that many users find it to be a lot of fun. That means they will not bore of it so easily and will be more likely to stick with a program.